So here it is, Sunday night, and I was like Hm maybe I'm not up to blogging right now since I have 12 other things I should really be doing but maybe I'll go and read some of my favorite blogs to rejuvenate my energy and to give me inspiration. So I headed over to one of my old favorite blogs, Teacher Will Run for Books, to find out Ashlee had nominated me for a Liebster Award! Wowza! Thank you Ashlee! Now I don't need to make an award celebrating my stinky-ness and instead can post a legit awesome award! 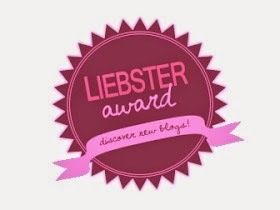 The Liebster Award is for blogs with less than 200 followers with the aim for us to discover new blogs. My job now that I was nominated is to answer 11 questions then nominate 11 blogs I think deserve the award. Like Ashlee, I started blogging as an undergrad assignment in the Fall of 2011 (three full years ago!) where I was supposed to blog about 15 books that I had read. Well I continued to blog about books at Teaching Voracious Readers even after the class had ended then decided I wanted to create a more generic teaching blog, hence Teaching Voracious Learners. 2. What 1 word sums up the heart of your blog and why? Hm. Right now: Sporadic. I haven't blogged in over TWO months and even though I have ten gazillion things I want to share finding the time as a first year teacher is tough! 3. Is there something you learned late in your blog journey that you wished you knew before? Hmm. Blog about what you are truly interested in and what you feel like blogging about. I think at first you are reading all these other awesome blogs and you feel like you need to replicate that awesomeness in your own blog...except that blog already exists! Just be yourself, whether it's with your blog topics, your type and style of writing, your blog design, even your blog picture! Just do you! Running - I ran my first marathon in October! It was awesome!! I ran it with my sister and I honestly had SO MUCH FUN! Fitting the training in once school starts is a total pain but it also offered an awesome escape and excuse for leaving work before some late hour. I also participated in the Virtual GO HARD (Hug-a-runner) Half Marathon this past weekend. That was a little less fun because a) it was cold, b) I hadn't tapered for it, and c) I was runningon a Friday after a long week at work (can you say tired?). But it benefited Girls on the Run.If you are a runner and want inspiration for a run (you can sign up for a 5K, 10K or a Half), head to Hug A Run at Run the Edge - you have until November 30th to sign up and run! I have a 5K in January and another Half in February so those are keeping me motivated to get out the door and run despite the dropping temps. Buying clothes - and when you buy a dress that doesn't fit because your tummy is too happy, it's kind of a bummer. Which is why I'm returning it and getting a bigger size. I know I should eat healthier but (sigh) I love food. I actually semi-organized my clothes this weekend and it was one of those moments where I got SO excited by the clothes I own I created more outfits then there are days to wear them. Despite the illogical number of sweaters (and shirts and scarfs and dresses) I own, I end up wearing the same 15-20 tops and bottoms each month. Sigh. I once tried to catalog all my clothes and only got this far before I got bored. 5. How many hours do you dedicate a week to your blog? 6. What category of blog post do you enjoy the most? Hm. I love the blog posts where they show you around your classroom- like classroom decorations or how they store supplies or have their classroom management system. Usually because they're always so pretty and inspiring. Link-ups and things I'm working on/doing that I really want to share with other teachers. 8. Which post have you written that you are most proud of? Hmm. I think it still is one of the original posts I wrote where I showed how to create comics with Word. I think personally I love projects where you create a digital product (whether it's a song mash-up, a video or a drawing) and I love discovering new purposes for everyday things. But I also love my How to Rock the Demo Lesson post maybe because it's the type of blog post I would have wanted to read as a new graduate. 9. Is there any post you've been planning on doing but have been postponing for a while? Um yes! The second grade at my school in conjunction with the specials teachers planned a project for the whole second grade where the students are going to create their own Thanksgiving Day parade based on Balloons Over Broadway by Melissa Sweet. Also: the funny things kids say to you. And: the ups and downs of being a first year teacher. And:My favorite new YouTube Video. And that picture of my hair from Crazy Hair Day. It's not that I don't want to write, it's just finding the time! 10. What is your favorite thing about blogging? Reading all the other blogs and interacting with the teachers. I have learned A LOT from other bloggers and they are always inspiring me. 11. What recipe, project or idea on my blog would you most likely try yourself? Definitely the Whole Brain Teaching Methods! I have used Class Yes with a few of my classes(I'm a K-2 technology teacher), but I really want to try some new techniques with some of my more challenging classes. 1. In your post, be sure to link back to your nominator as a shout out & a thank you! 3. Nominate 11 blogs of your choice who have less than 200 followers. Provide them with 11 questions or ask them to answer the questions above. 4. Let your nominees know they've been nominated and provide them with a link to your post so that they can accept. 5. Send your nominator the link to your post, so they can learn more about you... leave it in the comments below! Thank you again Ashlee for nominating me! You inspired me to blog again!